The Fish Counter has been on my list of places to visit this summer and luckily I had the time to venture around the Riley Park/Little Mountain neighbourhood. The Fish Counter somehow combines a grocery store, seafood vendor, and eatery and does so quite seamlessly and appropriately. The eating space is small but the shop as whole is just so rustic and inviting. Summer is probably the best season to visit for dine-in food as there is additional seating outside the shop. 4.5/5 - As someone who grew up beside Pajo's in Steveston, fish and chips is almost a summer staple food for me and there's no way I would leave here without a taste of the Fish Counter's version. The batter here to be thinner and less greasy than Pajo's which can work either way depending on how you like your fish and chips. Personally I like both but I did find that the cod itself wasn't as flaky or soft as Pajo's. I speak only for the cod by the way. The fried oysters are definitely a plus and very tasty. They're not on the level of Rodney's (which I blog about here) but it's a nice compliment to the fried fish. It's fried in the same batter as the fish and I feel that the thinner batter works better with the oysters than the fish. The fries are fresh and plentiful. The tartar sauce is pretty good but Pajo's still has my favourite. 3.5/5 - I had a different idea of this sandwich when I first saw the ingredients but having the crab and shrimp in a patty form is a new and cool way to present the ingredients as well. I like all the seafood and vegetables together in the sandwich but halfway through the devouring process, I didn't find it as enjoyable as the seafood blend became a bit bland for me. I think if there was more flavour in the patties and if the bread was grilled a bit, I would have liked it more. The Fish Counter is a delightful spot to visit as it is filled with so many staff who are incredibly passionate about seafood and are overall just very bubbly. I would love to look into buying some fresh seafood and some of the other products they sell as well. 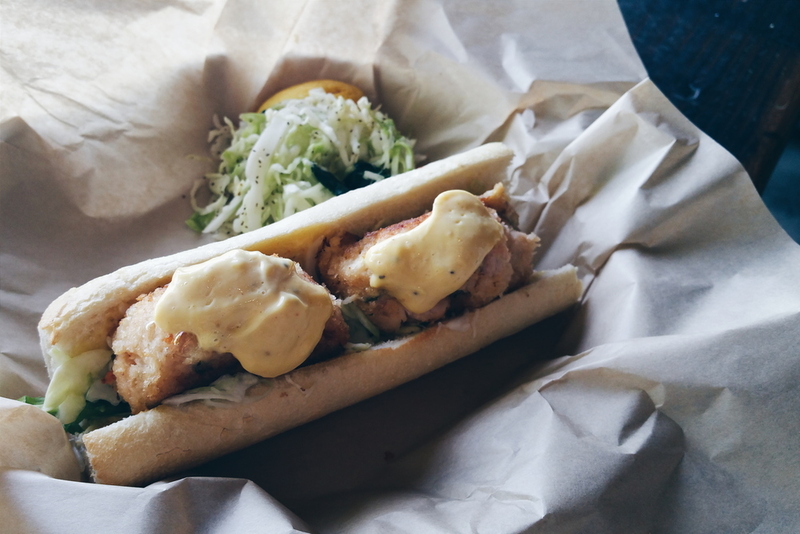 For now, I think I'll stick with their fish and chips and possibly try their tacos in the future... but then again the Oyster Po-Boy looks so irresistible haha. After this visit, I believe The Fish Counter is a good spot to go to if you either live in Vancouver or visit the neighbourhood but I don't find enough wow-factor in their food to make a deliberate visit from Richmond.